An automated surface production drill has followed computer-generated instructions to complete an entire drill pattern without human intervention. The operation was a world-first for the surface mining industry and major milestone in drilling development, according to Rio Tinto and Atlas Copco. Charles McHugh, manager mining disciplines at Rio Tinto, said a pattern was designed and the drill was directed to begin at the touch of button. The drill levelled, drilled and moved between rows, automatically completing the task. Through the partnership with Rio Tinto started in 2008, Atlas Copco was required to develop an automated drill rig that could be integrated with Rio Tinto's Mine Automation System (MAS), a system which provides the command and control of automated equipment at Rio Tinto's operations. 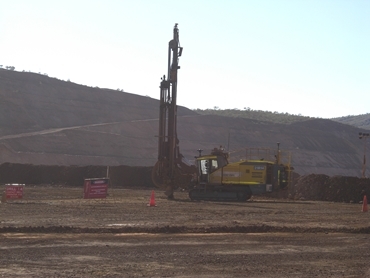 Rio Tinto further developed the MAS to remotely connect with the drill. These functions were tested at Rio Tinto's Pilbara iron ore operations as part of the Mine of the Future program. "Atlas Copco and Rio Tinto worked together to ensure that the tasks assigned to the drill could be received and carried out in an automated fashion with the drill operator located in the office," McHugh said. "We expect benefits both from a single operator being able to operate multiple drills and from flexible operation which will be possible between operators and potentially between operating sites. Importantly however we are also seeing improved drill utilisation and consistency in drill outcomes, providing more accurate information for mine operation." Rio Tinto has a substantial program in place to develop automated systems for its surface mining operations which create safer and more efficient operations. "The alliance with Atlas Copco will accelerate the development and deployment of autonomous drilling solutions for the surface mining industry," McHugh said. Benefits resulting from automating drills included improved operator safety, higher precision of the drilling process and improved equipment reliability resulting in superior performance. "For Rio Tinto, these advances are about achieving competitive advantage through step changes in mining that come from leadership in technology, starting with academic origin and resulting in a commercial outcome. "Through this approach we're changing the face of mining." Tom Ross, Atlas Copco surface drilling Australia business line manager, said the test site result was a landmark for the industry because it demonstrated the ability of software onboard the D65 crawler-mounted, articulated drill to communicate with the mining giant's MAS software and complete drilling tasks effectively under instruction from a computer. "Technology is the future in mining. I would like to think that we're at the forefront of that, and that's why the D65 (drill) being able to do this is a big flag being put on top of the hill, saying we're the first," Ross said. "The really clever bit was the ability of the machine to navigate 15 holes - three rows of five holes - without any human involvement, drill the holes, and then return to waiting stance to wait for further instructions. "The MAS system spoke to our rig, our rig understood the instructions and carried out the commands rather than it being remote controlled. That is maybe the first time the MAS system has spoken to controlled a rig. "This is something we have been working on for three years, so this is the accumulation of a lot of work to get to this point. "It's been really satisfying that we were able to do it. For us it's a world first on this class of drill rig, and for the alliance this means that we've got the proof of concept completed. "There are literally thousands of programmer hours that have been put in to get the two systems speaking to each other."